Takao is an area of Kyoto that is a bit remote, but very famous for its autumn leaves. It’s also a nice place to get away from the hotness of Kyoto’s summers, as it’s a mountainous area where the temperature is around five degrees lower than in the city. Takao is an area that turns to different shades of red and yellow in autumn, but in summer it turns to a green world of maple leaves. During this time of the green leaves, you can also enjoy food by the river, in a summer tradition that is called kawadoko. 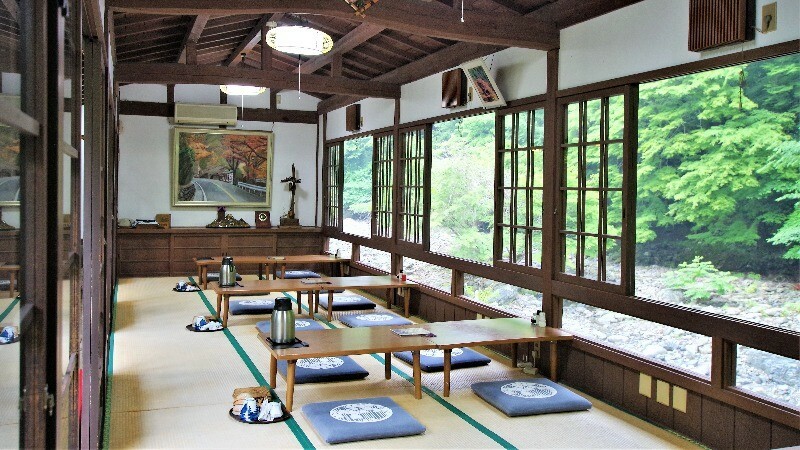 By the Kiyotaki River, you get to enjoy kaiseki cuisine and listen to the murmur of the river and enjoy the grandness of nature, all the while chatting with your friend. 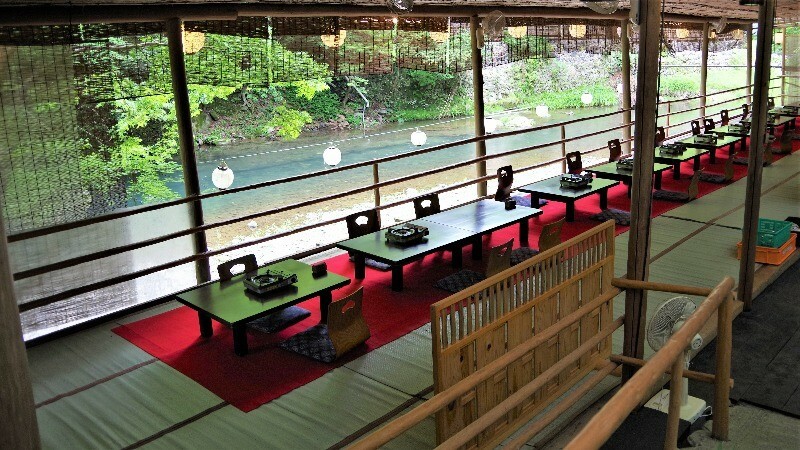 The most special thing about kawadoko-dining is, besides of course eating your food by a river, is that the food is made using seasonal, local ingredients, and often you even get to taste such seasonal delicacies as ayu sweetfish. 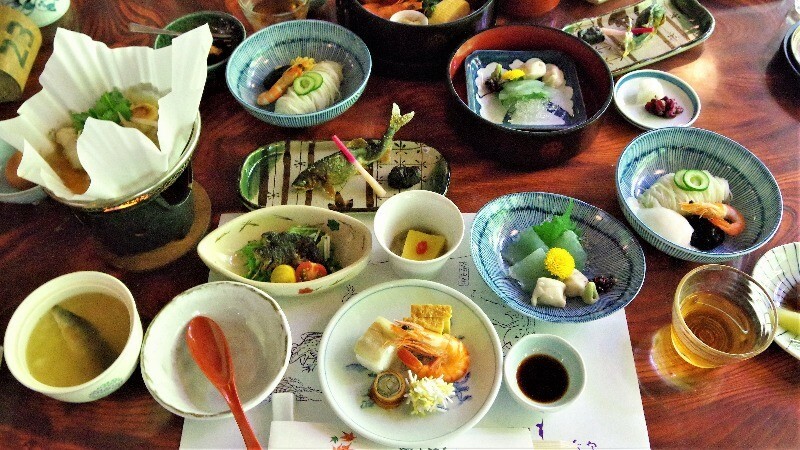 The dishes look beautiful, of course, but the colors of them are also very carefully thought out, as expected from the cuisine of Kyoto. You can enjoy kawadoko in Takao with Genji fireflies from the middle of June to the middle of July. During this time, after your kaiseki dinner, all the lights in the restaurant will be shut down, and you can enjoy looking at the dance of the fireflies. At dinner, they also have maiko, apprentice geisha, to entertain the guests, and you get to talk with her too. So come to enjoy the summer of Kyoto with some great seasonal cuisine! 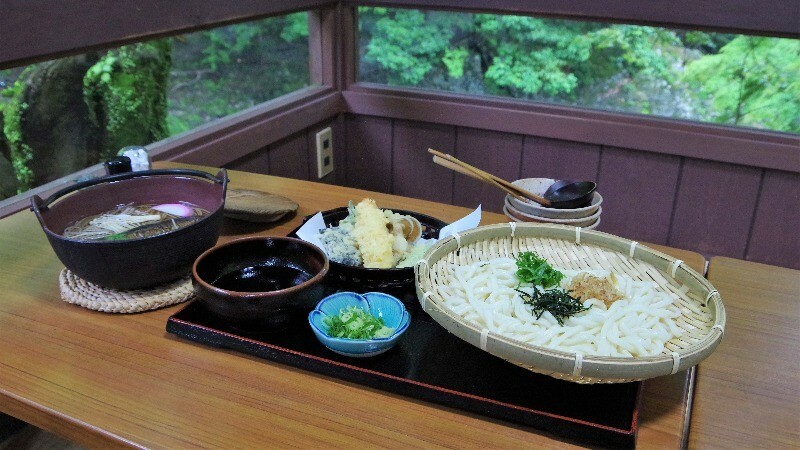 Togano Chaya is located in front of the JR bus stop of Tagano, and it offers meal sets with soba or udon noodles. Once you sit down on the kawadoko, you are surrounded by the beautiful green scenery and you can listen to the murmur of the river. You can enjoy nishin soba, or soba with a simmered herring, one of Kyoto's most famous dishes, at Togano Chaya – served hot, so this is especially great on a cold day. If you like udon noodles, note that Togano Chaya’s portions are really big. They also offer afternoon tea in Japanese style. You can enjoy warabimochi, which normally is served cold, but at Togano Chaya is served hot, with both kinako (roasted soybean flour) and kuromitsu-syrup. Warabimochi served hot was surprisingly good! It was an interesting, new take on this classic dessert. To enter Momijiya Bekkan, you have to cross a rope bridge, which leads you into a different world, a world where you’re a bit closer to nature, and where the food is a bit fancier than outside. In summer you can enjoy your food by the river, both lunch and dinner, with the main star of the experience being their excellent white somen noodles, which are served cold, and their ayu sweetfish. Some of the hotel rooms at Momijiya Bekkan, which is actually a ryokan, have a private “rotenburo” bath outside, so you get to take a bath while you enjoy the beauty of Takao’s nature. Takao Kanko Hotel is located next to the entrance of Jingo-ji Temple, and it’s a ryokan so can stay at it, but they also have a restaurant where you can enjoy seasonal cuisine even if you’re not staying at the hotel. 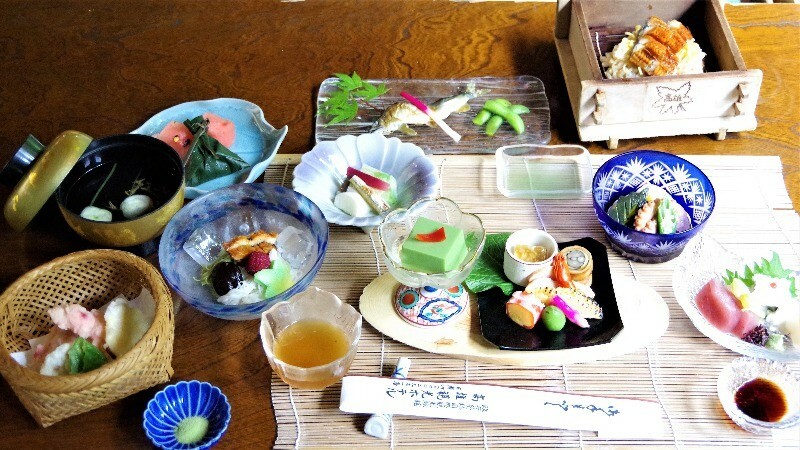 The summery kawadoko kaiseki they offer is delicious and colorful; a delight to the eyes. Besides their classic ayu sweetfish, the other main star of the kaiseki course is the rice topped with eel – the eel was so soft, the sauce on it so delicious, that you couldn’t want anything more. 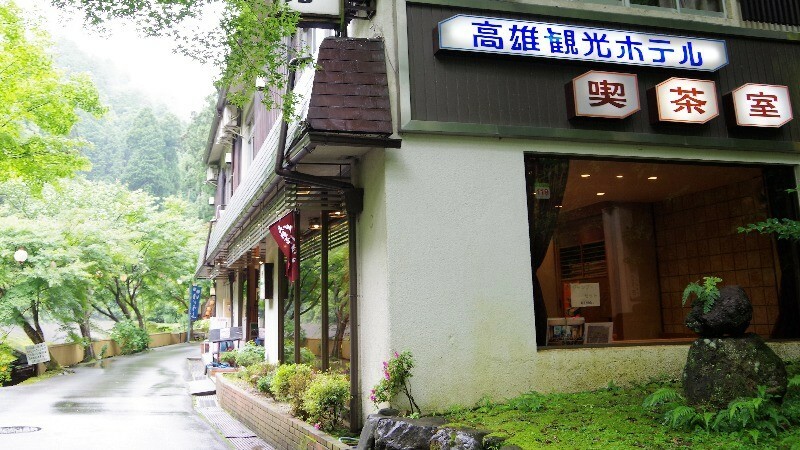 In Takao, the main star of kawadoko cuisine is most likely going to be somen noodles and ayu sweetfish, not to forget the beautiful nature around you. And at night in Takao, you can enjoy the fireflies, so this is a spot that definitely required a visit! 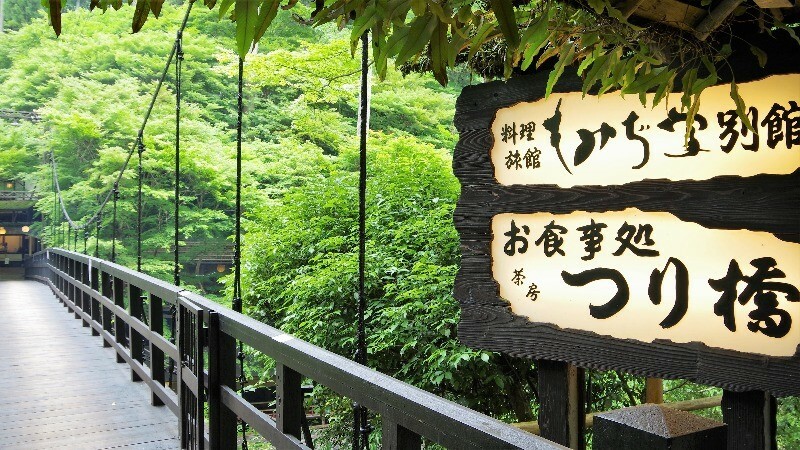 So if you want to enjoy the summer of Kyoto to the fullest, remember to visit Takao! Kawayuka dining platforms are an important part of Kyoto’s summer traditions, and they’re also popular among tourists. 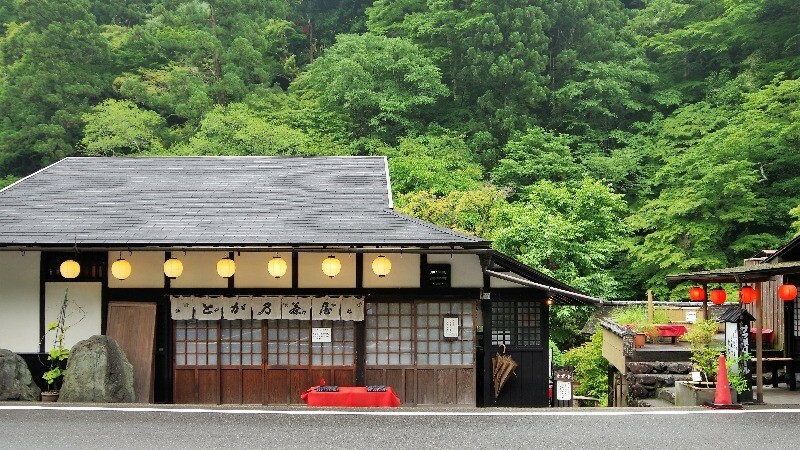 Different areas of Kyoto have different kawayuka traditions, but if you want to get away from the hustle and bustle of the city, it’s a good idea to take the trip to Kibune or Takao, and enjoy the beautiful nature of Kyoto and excellent food. 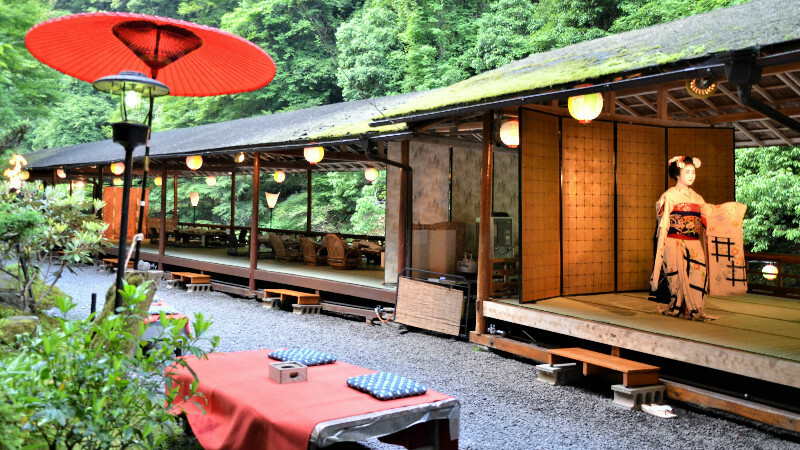 The summers in Kyoto are hot and humid, but the kawayuka in Kyoto are sure to keep you cool!